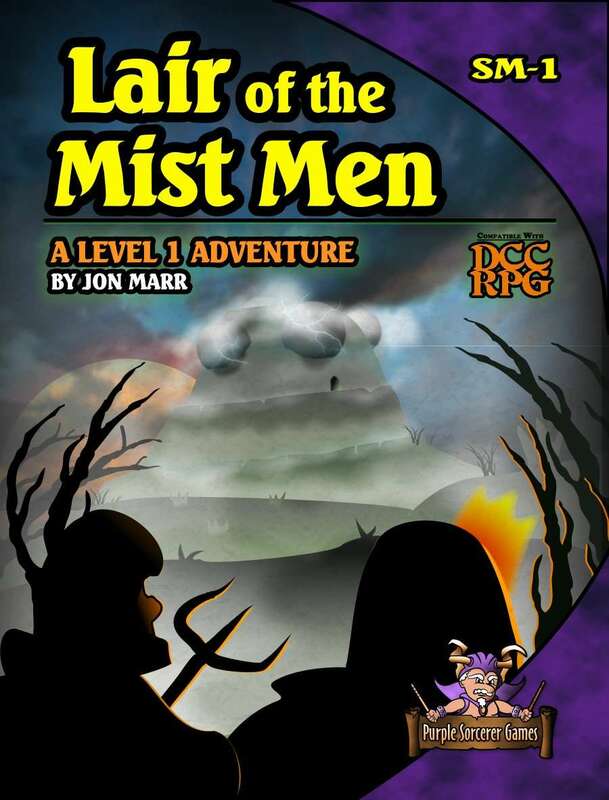 SM-1: Lair of the Mist Men is a level 1 adventure by Jon Marr. Art is by Jon Marr and Benjamin Marr. Cartography is by Jon Marr. The publisher is Purple Sorcerer Games. This adventure explores the Mist Men, extra-dimensional aliens first encountered in The Ooze Pits of Jonas Gralk. Players and judges have a chance to learn a bit about the Greyfolk who dwell in the Sunken City's vast swamp. This is also a good example of seeding one adventure within another, and specifically of using an encounter in a 0-level funnel to generate movement into the wider-world of fully-fledged adventurers. This adventure is also intended to lead into Against the Vortex Temple, which has yet to be released at the time of this writing, eventually allowing for further connections between adventures. 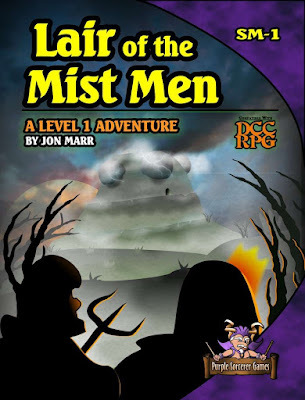 The Mist Men are well described and interesting, but this is a strange place that the PCs have entered into, and not everyone is going to get out of it the way they walked in. Appendix A: The Path to Madness is likely to gain some use. Like everything Purple Sorcerer does, there are extras. Appendix B reproduces the Mist Men encounter from The Ooze Pits of Jonas Gralk. A sheet of four 0-level characters is provided. Paper miniatures and battlemaps are available for download. This adventure is also reproduced in The Sunken City Adventure Omnibus & Guide.